The Gemological Institute of America (GIA) is one of the world’s leading organisations for the classification and grading of diamonds and other gemstones. The GIA is an incredible asset to the trade, the public and the media all over the world. Learn more about the GIA grading report. 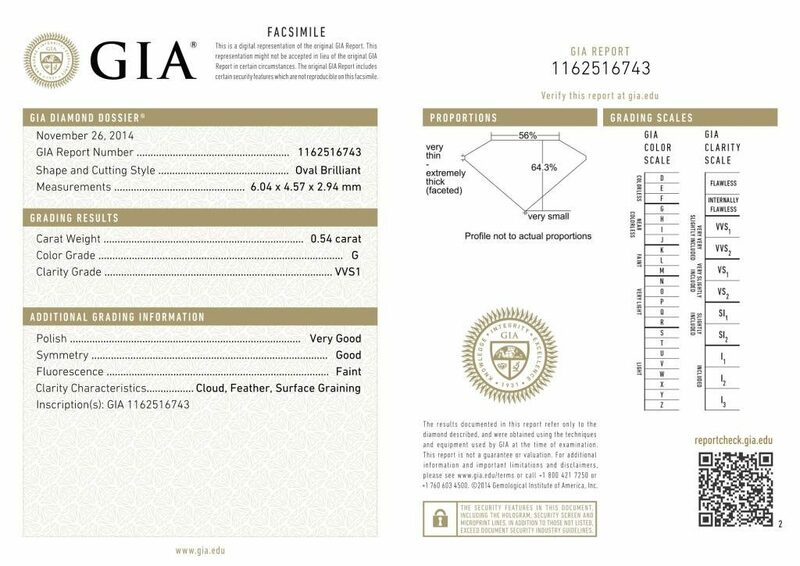 When the GIA grades a diamond, the grading comes in the form of a certificate. This report helps dealers and buyers to assess the quality and, therefore, the value of an individual stone. This certificate is useful if a jewelry piece containing the diamond is later sold, and also for insurance purposes. 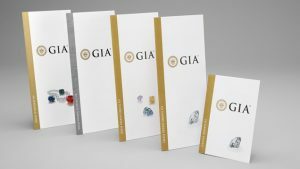 So what information, exactly, does a GIA certificate provide? The top section contains the GIA name and seal, a notice that – in this particular case – it is a digital copy of the original report, and the GIA report number. Anybody with the report number can check the validity of the report on the GIA website. This is public information and not just accessible by the certificate holder. GIA have changed their styles over the years and the certificates to vary, but the general layout has stayed more-or-less the same. On the left hand side, there are 3 sections. This section gives the date of the report, the report number (which should match exactly the number in the top section), the cut of the diamond and the measurements. As you’d expect from a round brilliant cut, the rounder the polished diamond is, the better. In order to measure the diamond, the gemologist will measure all the way around the diamond. The largest and smallest measurements will be included in the report within 1/100th of a millimeter. The third measurement is the overall height of the diamond, again to within 1/100th of a millimeter. Here, we see the 4Cs of diamond grading, carat weight, color, clarity and cut. Each is important when grading a diamond, and each will affect the value of the stone separately. For reference, the certificate includes grading scales for each of the Cs. The carat weight is the weight of the diamond, and this is used for grading as opposed to the physical size. Technically, a carat is a measurement of mass rather than weight, and 1 carat is equal to 200mg. The color is assigned based on a scale from D to Z, where D is considered colorless and Z has a light color. Anything beyond Z is termed “fancy”, which is why we often see descriptions such as “fancy yellow”. The clarity takes into account blemishes and inclusions in the diamond, as seen when using a 10x loupe. The scale has 11 grades from Flawless to Included 3, or I3. Flawless diamonds are extremely rare, and extremely valuable. If a diamond is Slightly Included, some blemishes or inclusions may be visible to the human eye. The cut is, in effect, a grading of the quality and craftsmanship of the finished diamond. If a D color, Flawless diamond is poorly cut, then the value will be greatly affected. The consistency in the standard of cuts has improved in recent decades due to improved cutting and polishing techniques, including the use of lasers. This section contains additional information which helps explain why the grading results above were achieved. Polish is a measurement of the smoothness of the diamond surface from excellent to poor. Symmetry – a key element of diamond grading – also has a grading from excellent to poor. Fluorescence is the level of glow visible when placing the diamond under ultra-violet light. The less glow, the more desirable. Clarity Characteristics are the blemishes and inclusions seen under a 10x loupe. The blemishes range from a published list of 11 and 10 possible flaws, respectively. 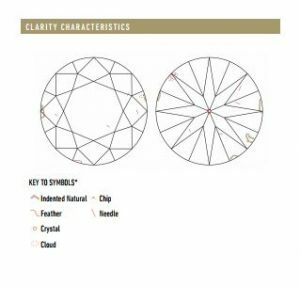 The next section of the certificate has a profile diagram of the diamond which is produced exactly to the proportions of the actual diamond. The measurements are a mix of percentages of the overall size of the relevant part of the diamond (table, crown, culet, pavilion, girdle) and in degrees for the angle of the pavilion and crown. The gemologist will add additional comments if relevant to the grading. At the right hand edge of the certificate are the grading scales used when evaluating the diamond. The three scales are Color, Clarity and Cut, each declining in grade from top to bottom. There is, of course, no scale for the carat weight, as the weight is what it is. A common question is why diamond grading begins at D, and not A. Before GIA formalized the color grading of diamonds, they were typically classifies as A, AA, AAA etc… Sometimes B or C grades were assigned. To avoid confusion and possible misuse of the new standards, GIA decided to separate its own system completely from what had gone before, and so started at D.
Do you still have any questions about your GIA grading report? Write the question in the comments below and one of our experts will try and help you out!